How to cache books in iTunes media folder? To void sync error with missing book files, you can cache books in iTunes media folder as shown in this tutorial. 3. Click "Edit > Preferences" menu. You see the preference settings screen. 4. Click "Advanced". You see the iTunes Media folder location: "C:\Users\fyicenter\Music\iTunes\iTunes Media". 5. 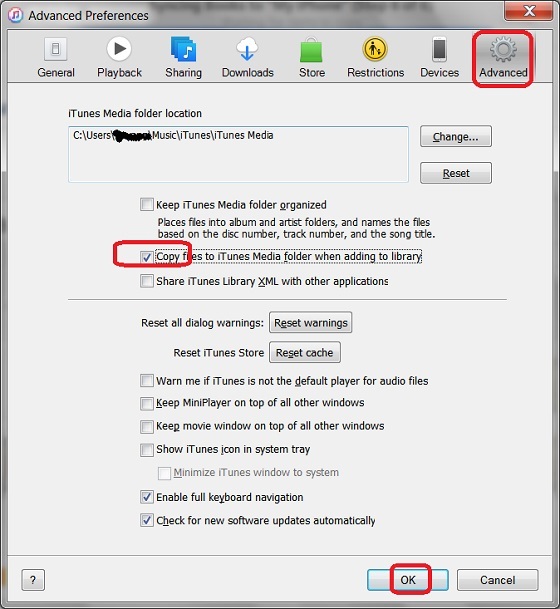 Click "Copy files to iTunes Media folder when adding to library" to turn it on. 6. Click "OK" to save changes. From now on, you should have any sync error, because copies of all books added to iTunes are also saved in iTunes Media folder.